Slowly but surely our house is being filled with leafy greens of all shapes and sizes and I am all for it. Both my husband and I have become VERY old before our time and now actually look forward to trips to the local garden centres on plant-buying missions, rather than seeing it as a chore. I find the bigger more out-of-control and wild-looking plants most attractive, as well as fitting my desire to turn our two-bed maisonette into some sort of leafy jungle. However, we did draw the line at buying a coconut plant after a spot of Googling told us that yes, it would really turn into a bloody big tree. 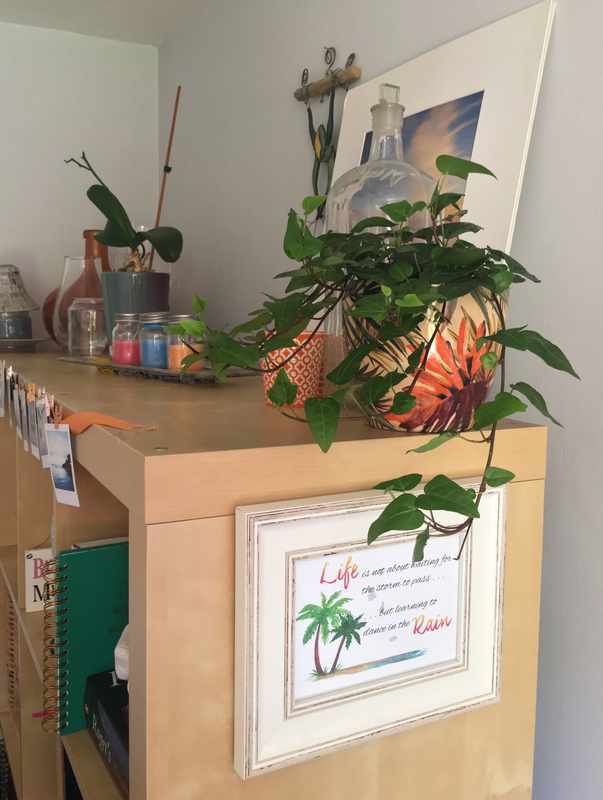 I’ve found that houseplants, as well as being good for improving air quality, help me feel calm, relaxed and lower my stress levels. Plus, I find the colour green super soothing, a colour that I’m now hooked on using for the bedroom – think pale sage with gold accents. Dreamy. My husband started with an orchid collection that now ensures we have one in every single room, following a pattern I can only believe was handed down from his mum. We have a mix of classic white and some of the pink ones but my favourite thing about an orchid is when the greyish roots grow upwards before cascading down the side of the pot. For some reason it makes me think of a kind of swamp creature, lurking below the surface. 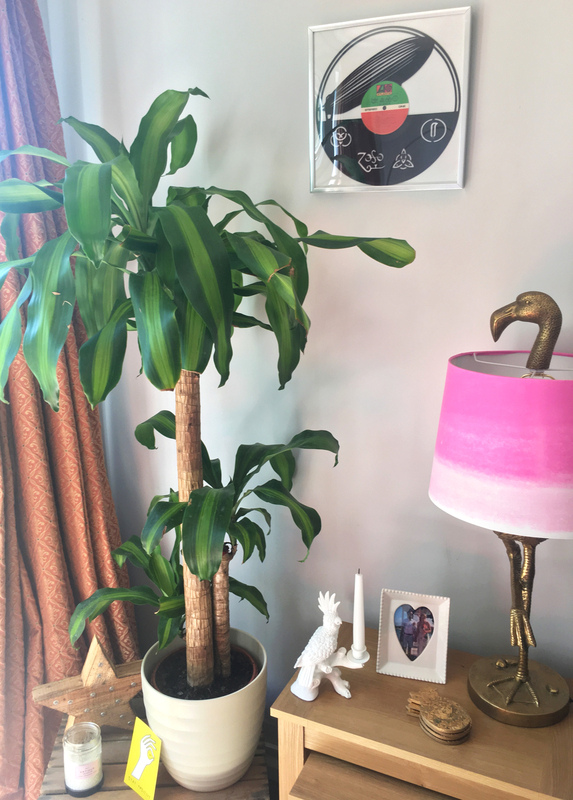 There was a period of mourning for a couple of Dracaena Marginata, unfortunately they got bad root rot – if you ask the husband, it’s due to my poor re-potting skills and not down to him at all. One plant made it, the Areca Palm, which now proudly sits on the kitchen counter, right near the husband’s beloved Bonsai Tree, which I’m not allowed near. Hence no photo. 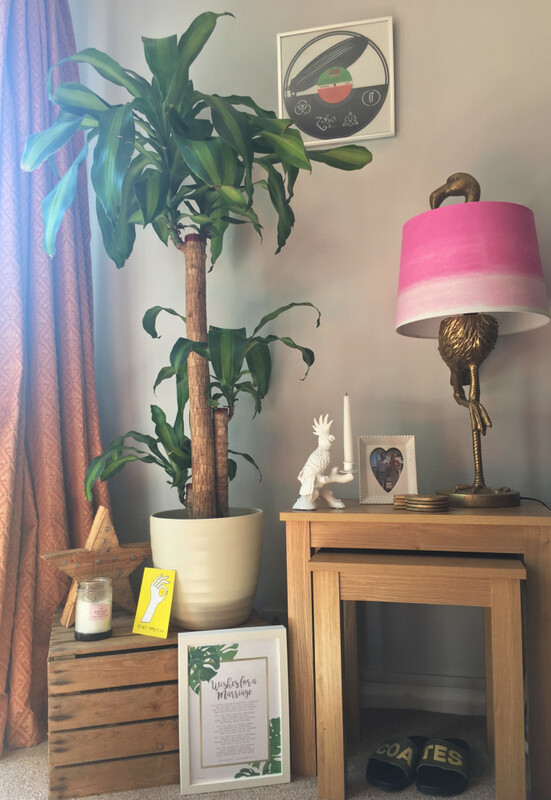 There’s a spot in the corner of our living room where this delicious Dracaena Massangeana lives. It perches proudly on top of a wooden crate to stop the bloody rabbit from nibbling it, digging up the mud and generally causing destruction. It sits alongside a wooden star, a candle or two and my treasured flamingo lamp. I’ve affectionately named this corner my tropical oasis. I like to sit in my bum groove on the sofa, staring at this peaceful corner to chill me out. We also picked up a small Hedera Helix for the top of our unit as I love the way ivy grows and cascades. It also breaks up the block of wood. Our bathroom is quite a sterile mix of white and grey, with purple and yellow accessories so we knew we needed to bring some life in. Al picked up a Schefflera Arboricola which continues to grow like an absolute BEAST. We believe we’ll wake up one morning and find it’s managed to grow enough to reach our bedroom, before trying to wind its way around our legs. Not sure why I’m putting that out there but I am. 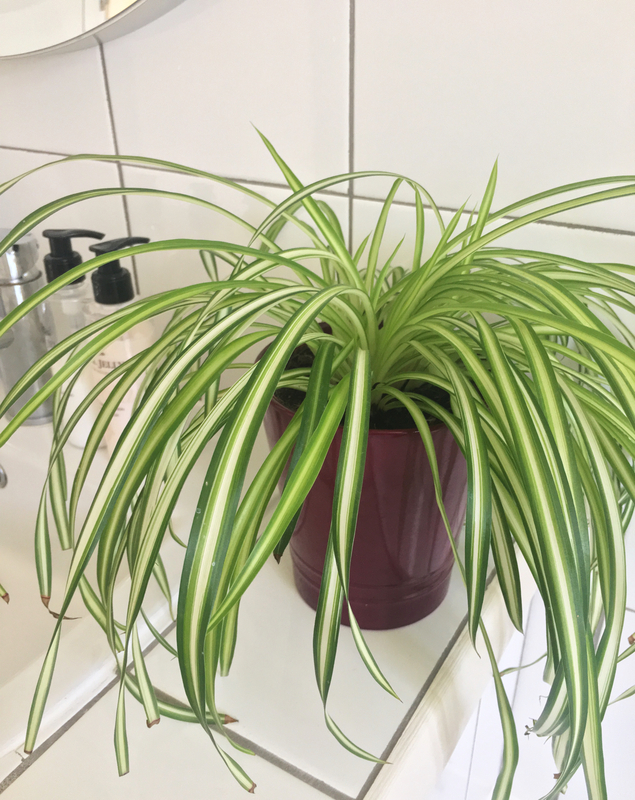 The latest addition to our plant family in the bathroom was the classic Spider Plant. I love the way each spiderette – check me out – springs out in any old direction. It’s a low maintenance plant, resilient and bloody fun. I have big plant plans for our bedroom when we finally get around to finishing the prep work needed before decorating *yawn*. I should make it clear, I am in no way whatsoever responsible for keeping these plants alive, that’s very clearly Al’s job. Keeping the bunny alive falls to me. Got any plant recommendations, I’m all ears.